This is a response from Nicola at Thorlabs. Thank you for your inquiry! There are several reasons that can lead to a DOP >100% like e.g. a divergent beam or an incorrect wavelength setting. Furthermore, the equation DOP=DOCP+DOLP is only valid if S1 and S2 or S3 are equal to zero. I will contact you directly to provide further assistance. Can it measure radially polarized light? THanks. This is a response from Sebastian at Thorlabs. Thank you for the inquiry. 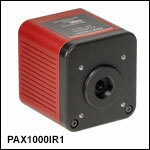 The PAX1000-Series can not spatially measure states of polarization. For this kind of measurements Polarization Cameras are normally used. I contacted you directly to provide assistance. Hi, I would also be interested in information about the SCPI commands to control this device from Linux. Thank you. This is a response from Sebastian at Thorlabs. Thank you for the inquiry. I contacted you directly to provide requested information. Hello, we would like to measure the polarisation of a source that emits light with a numerical aperture of NA=0.1. Is it necessary to collimate the light first or could the polarisation be measured directly? Thank you. This is a response from Wolfgang at Thorlabs. Thank you very much for your inquiry. For accurate measurement results the beam would need to be collimated first. 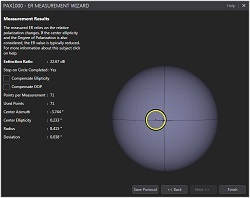 An uncollimated beam would lead to incorrect results. A suitable collimator for FC/PC connectors as well as an adapter for mounting are already included with each PAX1000 system. 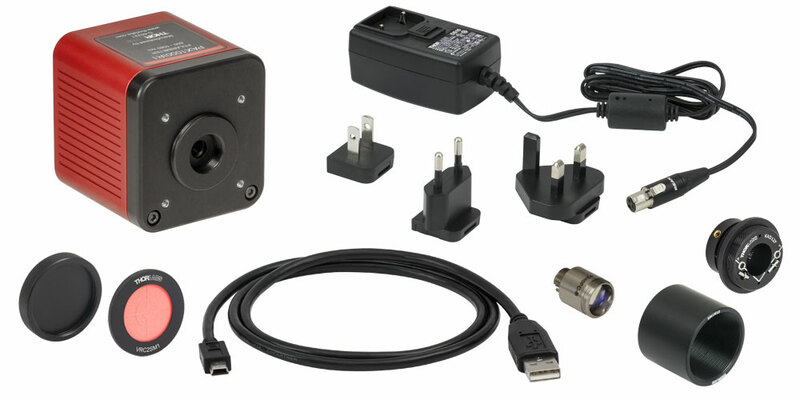 If you need a collimator for FC/APC connectors instead, we could offer this as well. I will contact you directly to provide further information. Hello, we are developing a hyperspectral polarization setup. We have a PAX5710. Please, tell me, is it possible to automatically switch the wavelengths of the polarimeter? What is the speed of this switching? Thank you. This is a response from Wolfgang at Thorlabs. Thank you very much for your inquiry. Unfortunately, there is no function in the software to switch the wavelength setting automatically. You could however use the provided driver files to write a custom application which could make these switches. The wavelength setting doesn't change anything in the measurement head, it is only used for the calculations of the polarization values. This means that the switching speed isn't limited by the measurement head, but by the software and the driver. So the computer you use, the operating system and even the programming environment would affect the maximum switch rate. Unfortunately, we don't have any test data for this. I will contact you directly to provide further information. This is a response from Wolfgang. Thank you very much for your inquiry. I will contact you directly and send you further information. Would be, please, available the list of direct USBTMC commands for the PAX1000 to work when writing a program for non-Windows or old OS ? This is a response from Wolfgang at Thorlabs. Thank you very much for your inquiry. It is generally possible to control the PAX1000 polarimeters with SCPI commands. I have contacted you directly to provide further details. One of the Spec notes specifies that All polarization specifications are valid for power range from -40 dBm to +3 dBm. Does this mean the measurement at the some part of the dynamic range (-60 dBm to +10 dBm) is not valid? This is a response from Wolfgang at Thorlabs. Thank you very much for your feedback. This note means that the specified accuracies are only valid for optical powers from -40 dBm to +3 dBm. 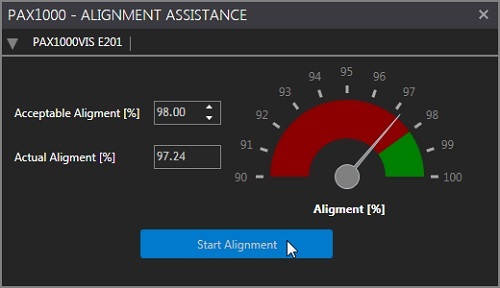 Outside of this range you will still get measurement values, however their accuracy can be worse. 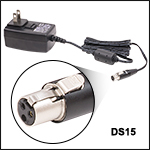 For powers below -40 dBm the noise in the amplification electronics will decrease the accuracy. For powers larger than +3 dBm non-linear effects in the photodiode and the amplifier electronics will cause a decrease in accuracy as well. I have contacted you directly to provide further assistance. This is a response from Wolfgang at Thorlabs. Thank you very much for your inquiry. Yes, we can provide replacement cables as a special item. We will contact you directly for further details. I'm having trouble with my PAX polarimeter in that it won't give consistent power readings. For example, whenever the beam is blocked (by my sample fixture), the power goes to zero. When I move the barrier out of the way, the polarimetry data returns but the power level is off by about -6dB. I have to move the sample completely out of the way to get the polarimeter to recalibrate itself. Any thoughts? Thanks! This is a response from Sebastian at Thorlabs. Thank you for the feedback. I have contacted you directly for troubleshooting and assistance. Dear Sir/Madam, the prices that are stated on your site are including a dedicated laptop. What is the cost of a PAX5710IR2-T system, without such a laptop? This is a response from Stefan at Thorlabs. Thank you for your inquiry, I have contacted you directly to provide you with price information for this special. The fiber P1-488PM-FC-2 - Patch Cable, FC/PC, 488 nm, PM You can concetar directly to the sensor polarimeter ? This is a response from Stefan at Thorlabs. Thank you for your inquiry. 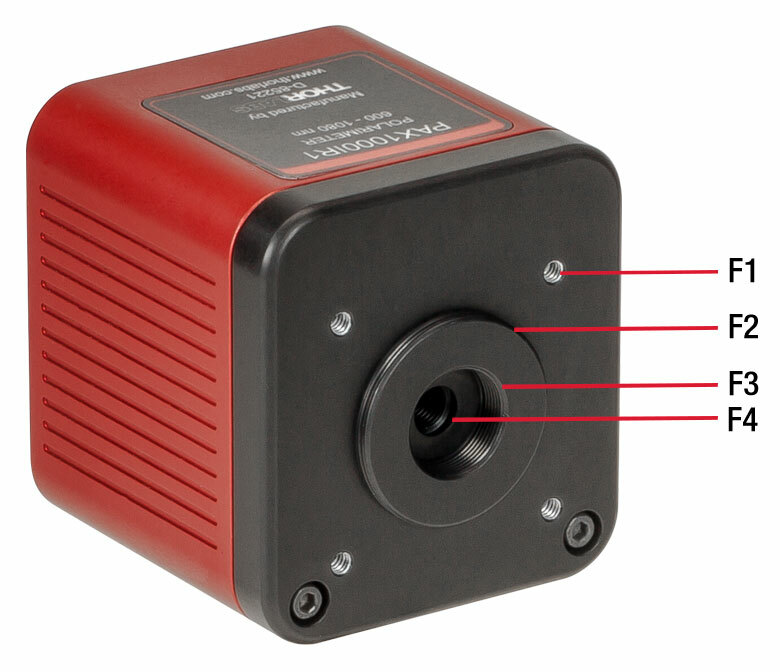 The external measurement heads of our PAX5710 series polarimeters can be used for free-space beams as well as for fiber-coupled measurements. A removable collimation package for a fiber connector input comes with each sensor head. On the website in the “Overview” Tab the different configurations are shown. I will contact you directly to discuss your application in more detail. Dear Sir/Madam, the prices that are stated on your site are including a dedicated laptop. What is the cost of a PAX5710VIS-T system, without such a laptop? This is response from Stefan at Thorlabs. Thank you for your inquiry. As you left no contact information could you please contact me at europe@thorlabs.com to provide you more information about the PAX system without Laptop. We have 626 nm light that goes from a PM fiber to a doubling stage and the 313 nm light ought to go into another PM fiber. It would be great if we could use the PAX for both. The stated range goes to 400 nm, but I assume it's not a sharp cutoff. How far down could you in principle use the polarimeter? This is a response from Stefan at Thorlabs. Thank you very much for your inquiry. Unfortunately the PAX will not work at 313nm, the unit is calibrated at the specified wavelength range (400-700nm). There are several critical points, the polarizer has an AR coating which is not made for this wavelength therefore losses will increase. The retardance of the built in quarter waveplate will be also different at this wavelength. 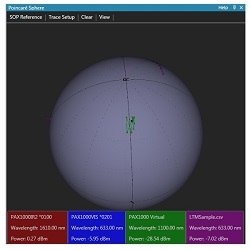 As there was no calibration done at this wavelength, it is also not possible to select the wavelength in the software. At 313nm you are too far away to get reliable results. We are currently working on the development of a new PAX system which would also allow measurements in the UV. I will contact you directly to check your needs in more detail. Is there any estimation for the sensitivity of the polarimeter for each head? In the specs it only appears -60 to 10 dBm, but I would need to know the sensitivity for my head (PAX5710IR1-T 700-1000 nm). Thank you. This is a response from Stefan at Thorlabs. Thank you very much for your inquiry. The built in measurement sensor in general can measure from -60 to 10 dBm, this range is valid for all measurement heads (VIS, IR1,IR2,IR3) . It has 5 gain settings and the corresponding power range depends on the wavelength selected. The maximum power setting for each range (at the selected wavelength) gets displayed. The recommended and default setting of the power range is 'auto', whereby the optimum power range will be set automatically. Unfortunately you left no Email address. Please contact me at europe@thorlabs.com to discuss your application in more detail. 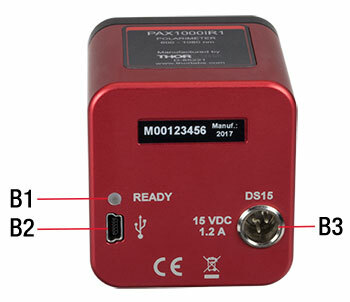 I would like to get the Mueller matrix of an optical device using the PAX. In the manual, this can be read: "The 16 real-valued elements mij (i,j = 0,1,2,3) that build the Mueller matrix of an optical component can be determined by measuring the 4 different Stokes vectors that enter and leave the component. For each of the 4 different polarizations, measured by a polarimeter with and without device under test. The Mueller matrix can then be calculated out of the 8 determined Stokes vectors." But it doesn't say how to do this: how to calculate the Mueller matrix from the 8 Stokes vectors. How can I do this? Thank you. This is a response from Stefan at Thorlabs. Thank you very much for your inquiry. In the Mueller calculus , the Stokes vector S is used to describe the polarization state of a light beam , and the Mueller matrix M to describe the polarization-altering characteristics of a sample . The Mueller matrix M for a polarization-altering device is defined as the matrix which transforms an incident Stokes vector S into the exiting (reflected , transmitted , or scattered) Stokes vector S‘. From a set of polarimetric measurements , you can develop a set of linear equations which can be solved for certain of the Mueller matrix elements . Since the Mueller matrix is a function of wavelength , angle of incidence , and location on the sample , these are assumed fixed in this simplification. A polarization generator prepares a set of polarization states with a sequence of Stokes vectors Sq . The Stokes vectors exiting the sample are MSq . These exiting states are analyzed by the qth polarization state analyzer Aq , yielding the measured flux Pq Each measured flux is assumed to be a linear function of the sample’s Mueller matrix elements. For sharing more detailed calculations I would like to contact you directly. Unfortunately you left no Email address. Please contact me at europe@thorlabs.com to discuss this in more detail. Since the Mueller matrix is a function of wavelength , angle of incidence , and location on the sample , these are assumed fixed in this simplification. A polarization generator prepares a set of polarization states with a sequence of Stokes vectors Sq . The Stokes vectors exiting the sample are MSq . These exiting states are analyzed by the qth polarization state analyzer Aq , yielding the measured flux Pq. Each measured flux is assumed to be a linear function of the sample’s Mueller matrix elements. For sharing more detailed calculations I would like to contact you directly. Unfortunately you left no Email address. 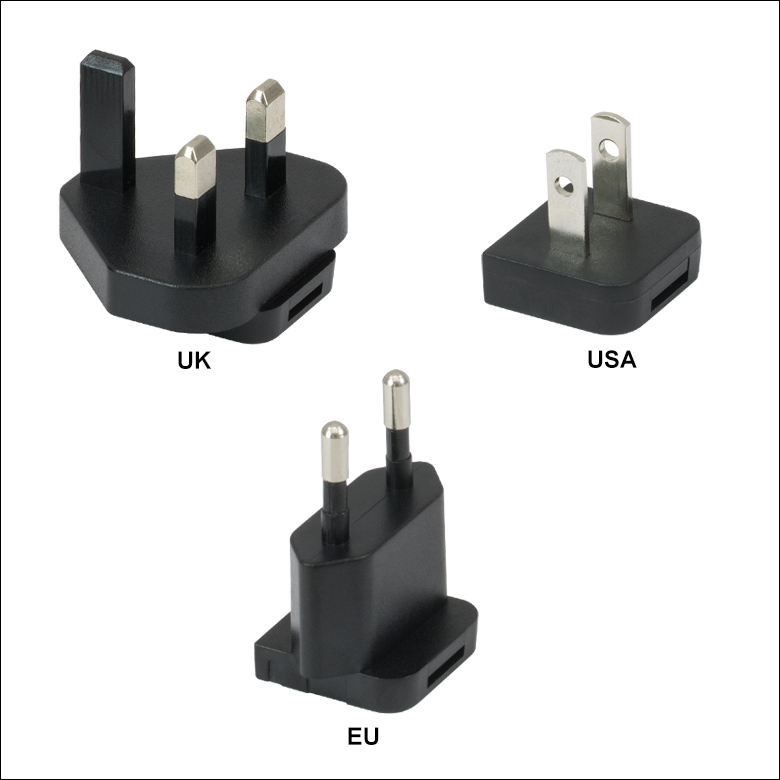 Please contact me at europe@thorlabs.com to discuss this in more detail. I would like to know what point of view the polarimeter is giving me the measurements from. I have two measurements, each of one from a different source: M1=Horizontal and M2=+45º, and I want to know the relative angle of M2 relative to M1. If the polarimeter is giving me the measurement directly from the point of view of the source, the relative angle of M2 relative to M1 would be directly -45º. However, if the polarimeter is giving me the measurement from the point of view of the polarimeter, then I would have to make the transformation to view it the 45º angle from the point of view of the source: the H polarization would be the same viewed from any point of view, but a +45º from the point of view of the polarimeter would actually be a -45º from the point of view of the source. Then the relative angle of M2 relative to M1, after making the transformation, would be +45º. Thank you. This is a response from Thomas at Thorlabs. Thank you very much for your inquiry. 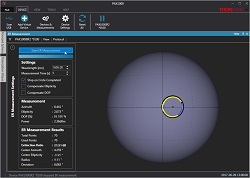 The polarimeter gives you the measurement directly from the point of view of the polarimeter. 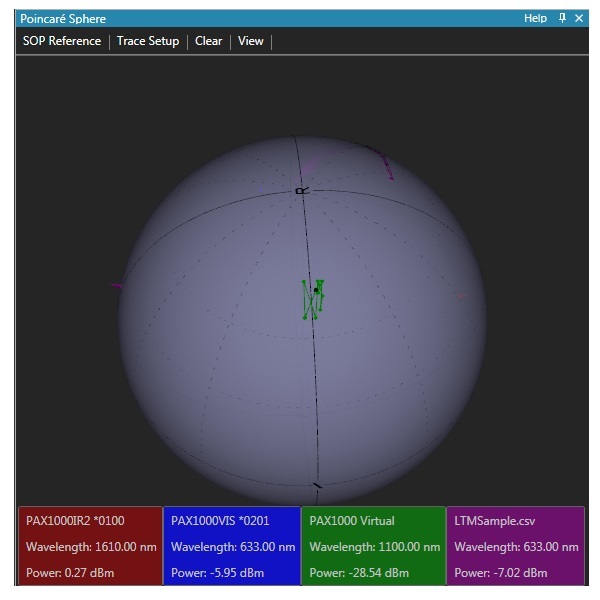 You can set an azimuth offset in the software to transform the point of view. 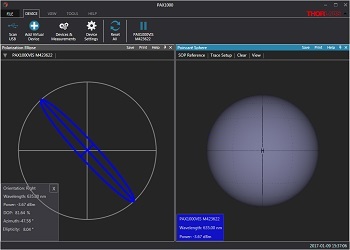 This means that you have to set the azimuth offset to 180° to get the point of view of the light source. I will also contact you directly for any further questions. Hello Thorlabs, The product is extremely helpful. However I need some help regarding that. I'm trying to use two slots of the polarimeter at the same time. When I connect it to my laptop, only one slot is being recognised. I have tried setting no. of slots as 2 in setup wizard but still my system is recognising only one slot. So kindly suggest me on how to use two slots at the same time. This is a response from Stefan at Thorlabs. Thank you very much for your inquiry. With the current software it is unfortunately not possible to control more than one card from the same software instance. But you can open several instances of the GUI and select different cards to control them at the same time. I have contacted you directly for discussing your application in detail. Is it possible to check the error of the instrument e.g. are reference targets, filters ect. available? We run three instruments and whant to check the accuracy - and if it is out of range send it to service. This is a response from Stefan at Thorlabs. Thank you very much for your inquiry. 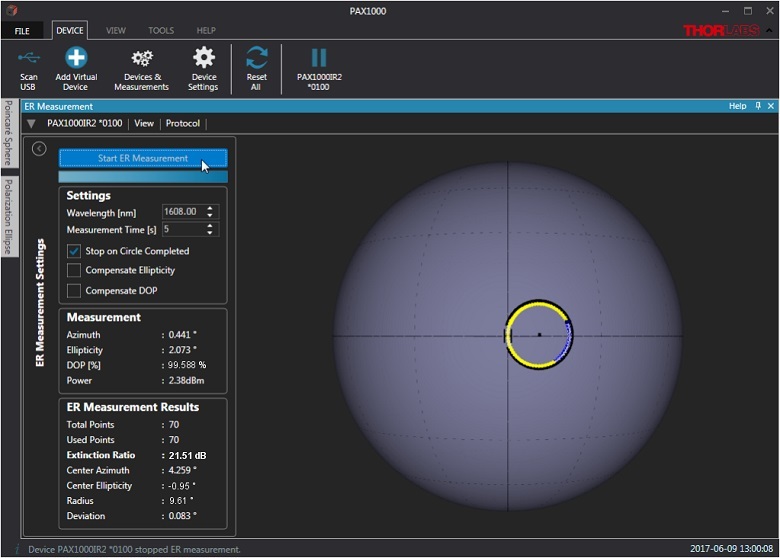 You can check if your devices work within the specifications by using a polarizer in a rotation mount in front of the Polarimeter. 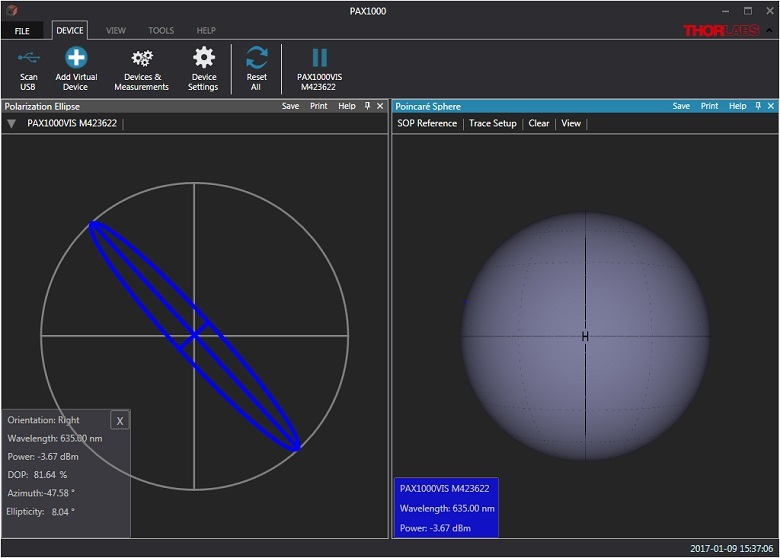 By rotating the polarizer you can check if the values given out by the PAX correspond to the set angle at the rotation mount. For example for 0° incoming angle the azimuth of the PAX should be 0°+/-0.25° and the degree of polarization 100%. For 10° the azimuth should be 10°+-0,25°, the DOP remains at 100%+/-0,5%. 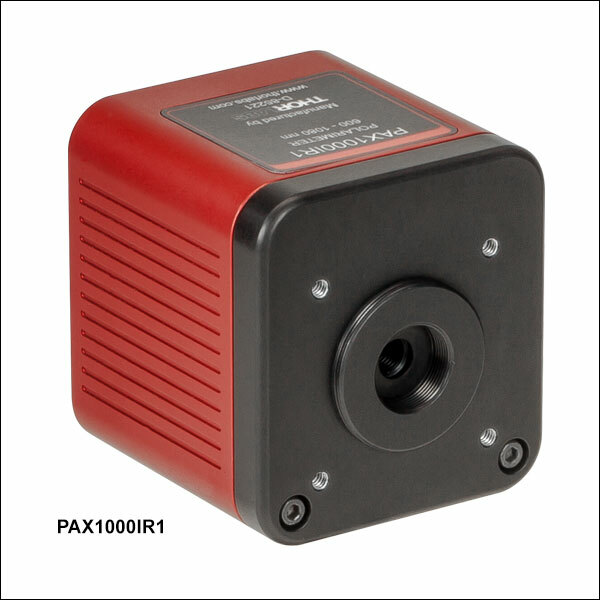 This way up to 180° you can check the accuracy of your PAX systems. This is basically the measurement principle also used in our calibration setup. For highest precision of the measurement we recommend to recalibrate the PAX every two years. I will contact you directly to discuss your inquiry in more detail. This is a response from Stefan at Thorlabs. Thank you very much for your inquiry. We offer in-Line fiber coupled Polarimeter which we specify with a sampling rate of 1 Million Samples per second. You can find these devices with the part number IPM5300 under the following link: http://www.thorlabs.de/newgrouppage9.cfm?objectgroup_id=929&pn=IPM5300 I will contact you directly to discuss if these Polarimeter are suitable for your application. This is a response from Thomas at Thorlabs. Thank you very much for your inquiry. In normal operation the PAX57xx card does not need any service. For highest precision of the measurement it is recommended to recalibrate the PAX57xx every two years. You can see the due date of calibration in the card info-menu of the card driver to determine the recalibration date. If you want to recalibrate your polarimeter you should contact the technical support of Thorlabs and they will arrange a RMA (return merchandise authorization) for you. 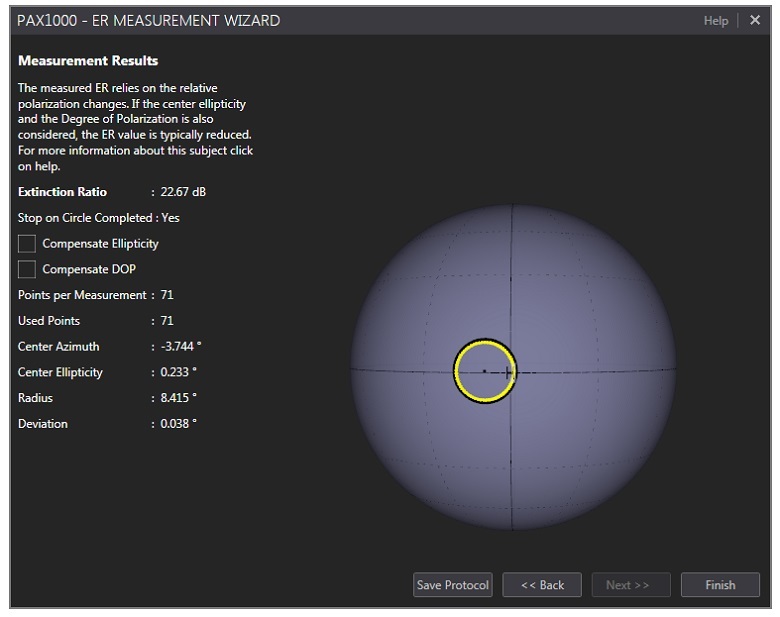 A response form Thomas at Thorlabs: The error message "eigenmodes are not strictly linear" appears when the center of the circle is too far away from the equator on the Poincare sphere. This can have several origin, ranging from a poor coupling into the fiber to the fact that the fiber contains any element that transforms the polarization (for instance a piece of non PM fiber). In some cases, some stress can occur in the connector that leads ot a transformation of the SOP within the distance that is stressed. I will contact you directly to help finding out what the origin of this effect can be in your case. Response from Buki at Thorlabs: Thank you for your feedback. Unfortunately, we have not been able to track your email. We have contacted you directly to ask you to resend the quote to TechSupport@thorlabs.com so we can prepare a quote a for you. We usually respond to inquiries within 24 hrs. Hello, This is Sanmina-SCI optical technology Shenzhen Ltd. I sent an email to Thorlabs for one calibration quotation for our PAX system on April 22.But I do not get any respond till to today. 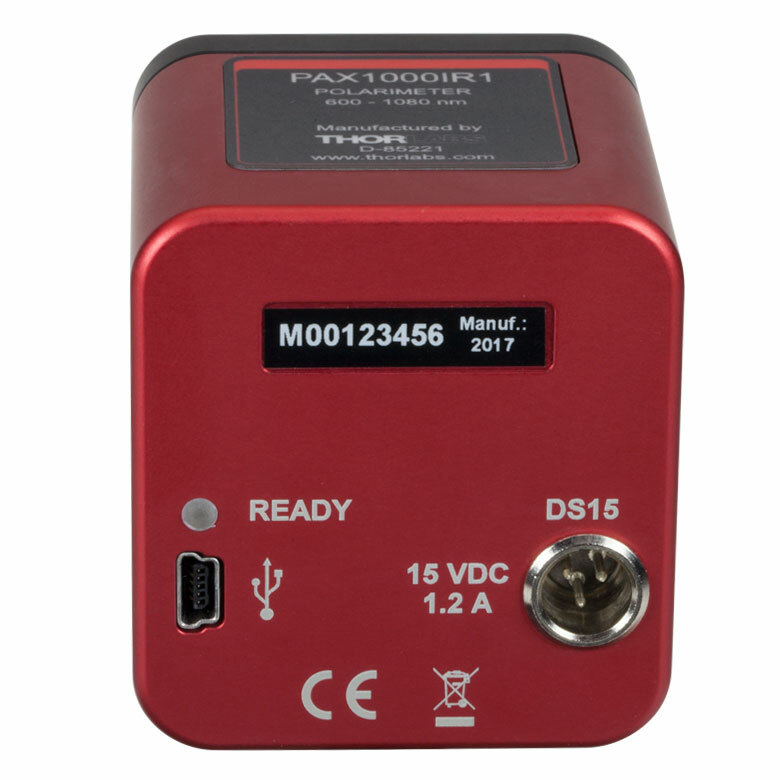 The limitation of max of 1024 datapoints is given for the scope mode of PAXs graphic user interface and the reason for it is the internal memory size of the polarimeters DSP. This enables to record each acquired data point, even at the highest sampling rate. The downside is the limited memory size. With the current hardware design the memory cannot be extended. However, we have noticed this feature is required and will consider that for future product design. A response from Greg at Thorlabs to oguz.celikel: Thank you for your interest in Thorlabs products. One of our Applications Engineers will be in contact with you shortly.